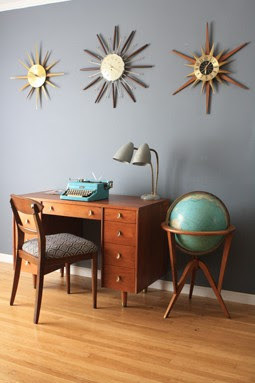 This week's Salvaged Chic of the Week is the sophisticated Mad Men Desk. Johnelle revamped this vintage beauty for a client. One of the many great things about this desk is that is can also be used as a vanity. 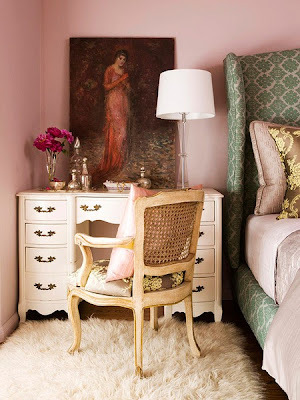 In a shared room, this stunner let's a masculine vibe play with your girly goodies that us ladies love to use. 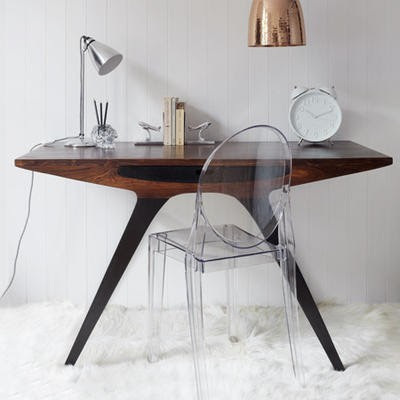 I love the shape of this desk.. it's sleek lines, tapered legs and capped feet all make it so sharp. Johnelle also added vintage pulls that play off that mid-century love affair this piece has going for it! Because of the sleek lines that these mid-century pieces have they're perfect for personalizing. 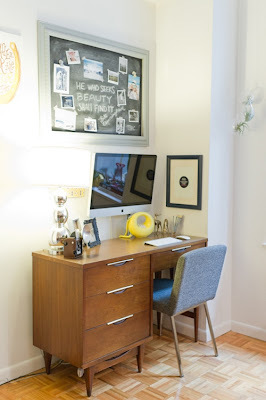 Here you can see how styling a desk like this can create quite a punch! Or how you can style a desk like this with eclectic selections of your favorite books, a collection of potted plants with bright colors and art for a more eclectic vibe. 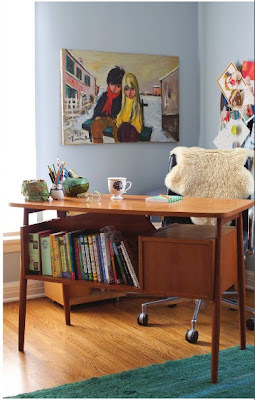 A mid-century desk similar to our Mad Men one is also perfect for a very practical modern day office. Mounting your computer on the wall is a perfect way to off set the more shallow desk,using a laptop would also work well. While this desk may not have been redesigned for this purpose, I love the idea of a vintage desk being the vanity in a bathroom. Not only does a desk give you ample space, but it also makes it possible for someone special to keep you company while you're in the bath...ha! desk to match your style accordingly. 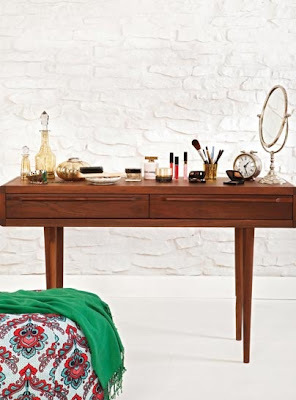 Vintage desks are also perfect to double as vanities in your bedroom. 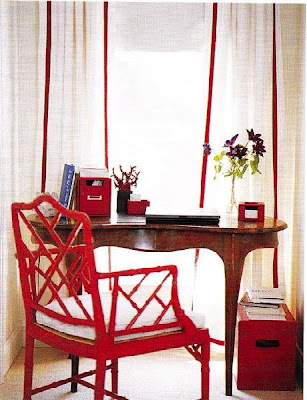 Books or writing materials can quickly be moved aside for your favorite baubles and that perfect shade of red lipstick. Television, magazines, or art are all great places to gather inspiration. Whether you find a color you're in love with, a style, or even just a feeling, they're all perfect jumping off points for the redesign of your new piece. Feel free to email us at quotes@mignonnedecor.com to begin a dialogue.